Cindy the chimpanzee and friends. Disabled facilities - disabled toilets, wheelchair swings in children's play area, sensory statues, mobility scooters to hire (no charge, just a deposit), written keeper talks for hearing impaired visitors, first aid. Accessibility - You cannot access the woodland walk in mobility scooters etc, but the rest of the park is accessible. There are some fairly steep slopes and the centre is large so I would recommend booking one of the mobility scooters if you have mobility problems. Dogs welcome - No pet dogs. Assistance dogs are allowed, but this must be prearranged with the park. Assistance dogs are unable to go into the Malagasy Lemur walk through as the lemurs roam free in this area. I'll start off this review by saying that I had very high expectations of Monkey World - and the centre, staff and wonderful primates more than met these expectations. More than a week after our visit I still can't stop talking about it - I'm sure I must be driving my family mad! Monkey World is featured in the Monkey Business and Monkey Life TV programs that are regularly shown on Pick TV and various Sky channels. I'll quite happily admit to being addicted to these programs and I couldn't wait to see some of my favourite characters from the shows. We visited on a Thursday during term time in June, so the park was fairly quiet but I imagine it gets very busy at weekends and during school holidays as it's a perfect place for families to visit. During my visit I was accompanied by my mum, who is also my carer, and my assistance dog Elgin. We had arranged in advance for Elgin to accompany me and all primate care staff were aware that there would be a dog on the premises. Elgin was allowed everywhere in the park except the lemur walk as the lemurs roam free in the area, which is totally understandable and I knew this in advance of our visit. Bryan the chimpanzee who was rescued from life as a beach photograpger's prop in Mexico. When we arrived at the park we were greeted by a very friendly member of staff, I believe his name was Kevin. He was extremely welcoming and helpful, and he carried in our boxes of donated goods for us as they were heavy. Throughout the day we bumped into him a few times and he always stopped to greet us, he is definitely a credit to the Monkey World team. I also saw him helping visitors with mobility issues, teaching them how to use the park's mobility scooters etc. In fact all members of staff that we met were extremely helpful and friendly - from those at the gate, to the gift shop, to the cafes and the animal care staff we met around the park. We were made to feel very welcome, and all the other visitors that we met on the day agreed that Monkey World has a very friendly, happy atmosphere. As a disabled person I sometimes feel that I'm missing out at visitor attractions because there is usually so much that I can't do, but Monkey World have obviously made a huge effort to ensure that everyone enjoys their visit. The park is large and has some steep slopes that may be tricky for visitors with mobility problems, so they have eighteen motorised scooters available to hire. I took my own scooter so that I wasn't using one that another visitor could use, but I was most impressed that these scooters were free to hire. All you need is a deposit and ID, but it's best to ring the park in advance to reserve a scooter, especially at busy times. The only part of the park that you can't access on mobility scooters is the woodland walk. One of the things that I was most impressed with is that there were wheelchair swings available for children who are wheelchair users. I saw one being used and the young lad had a marvellous time, the joy on his face was delightful. It's so nice that disabled children have the opportunity to enjoy things that most children take for granted. For visually impaired visitors there are three sensory statues that give them the opportunity to feel the shape and size differences of a male orangutan, a chimpanzee and a tiny marmoset. I saw these being made on one of the Monkey Business TV programs, and they are even more impressive up close - the amount of detail is incredible. These are kept behind a fence to prevent damage, but visually impaired visitors just need to ask a member of staff for access. Guide dogs and other registered assistance dogs are allowed to accompany visitors, but you must inform Monkey World before your visit. This is so that all animal care staff can be notified that a dog will be on site and so that they can make any adjustments necessary to ensure the welfare of the primates. 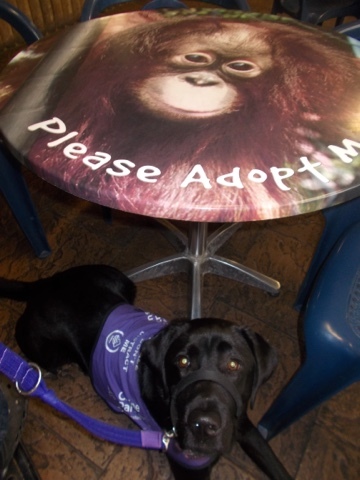 Everyone made my assistance dog, Elgin, very welcome - and that includes the monkeys too! They all seemed fascinated to see a dog - they probably thought he was a very funny looking monkey! Sensory statue of Tuan the orangutan. Most of the primates have been rescued from a life of abuse and neglect and are now living a happy life at the rescue centre. 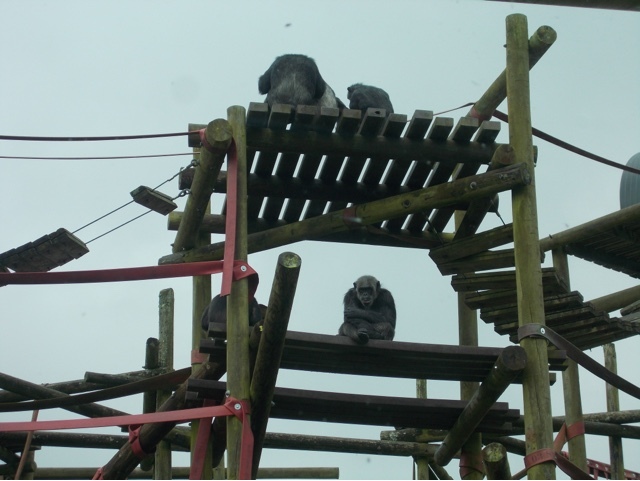 Monkey World is celebrating their 30th anniversary this year, and it amazing to see how much they have achieved in those thirty years. 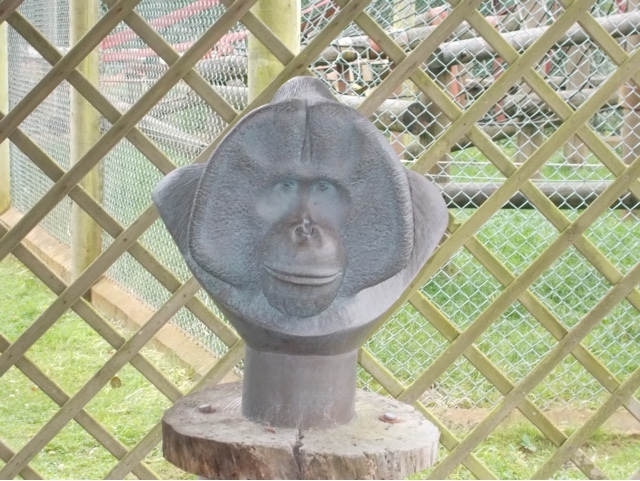 The ape rescue centre was founded by the late Jim Cronin MBE when he and his supporters rescued a group of chimpanzees from a life as beach photograpger's props in Spain. Many of these original chimpanzees are still at the park and it is amazing to see how they've flourished under the expert care of Monkey World. Some of these chimps were drugged, abused and forced to wear clothes, and they are now happily living with other chimps in wonderful enclosures. They have so much to keep them busy, and the keepers give them lots of enrichment to keep them active and to help them develop natural behaviours like foraging for food. The enclosures are huge, especially for the chimpanzees and orangutans, and they were designed with the needs of the primates in mind rather than visitors. This means you can't always spot every single primate, but there are plenty of different viewing platforms and windows so we spent hours watching all of the monkeys and apes have fun. The orangutans in the nursery group were particularly cute and entertaining to watch, they really were adorable. There are plenty of places to have lunch or a snack at the park. There are two large cafes called Treetops and The Watering Hole, an outdoors cafe with undercover picnic benches called Malagasy. Plus ice cream and refreshment kiosks and picnic areas if you want to bring your own food. We did take a picnic because my medical conditions mean I choke very easily and I get embarrassed coughing and choking in busy cafes, and there were plenty of different area to enjoy our lunch at. We did go to the Treetops Cafe for a coffee twice though. The coffee was delicious and very reasonably price, the staff were also very friendly. The tables were well spaced out so there was plenty of room for my scooter, it may be a bit more awkward to take scooters inside on busier days though. There were also lots of tables outside the Treetops cafe where we sat for our afternoon coffee. From here you have an excellent view of the chimpanzees in Hananya's group - the perfect place to have a relaxing drink or a bite to eat. The Watering Hole cafe was closed during our visit and we didn't use the Malagasy cafe so I can't comment on those. Mum is gluten intolerant and often struggles to find something she can eat when we're out, so we were very impressed to see a small gluten free menu at the Treetops cafe. There was a choice of cakes, soup and bread, sandwiches and jacket potatoes with fillings that were gluten free. Plus, unlike a lot of other places, the prices of the gluten free products were very reasonable. I can't write about the cafes without mentioning the tables! They have photos of different primates available for adoption on them, and as you can see from the photo below, they are completely adorable! I would love one of these in my garden!! During the afternoons there are various keeper talks about the different species of monkeys. I'd definitely recommend these, they are very informative and entertaining. The staff are clearly very passionate about their work and the animals in their care so it's well worth going to at least one of the talks. Young orangutan exploring. I think this is either Jin or Silvestre. There is a large gift shop with a huge range of products available. I didn't go in the shop as by the end of my visit I was very tired and my pain levels were sky high, but I sent mum in to get me some items that I'd seen on the online store. Mum was very impressed with the range of products, prices and especially the helpful staff. She bought lots of items for me, including jewellery, and it came to a lot less than she was expecting. It's nice to find a tourist attraction that doesn't bump the prices up ridiculously high. 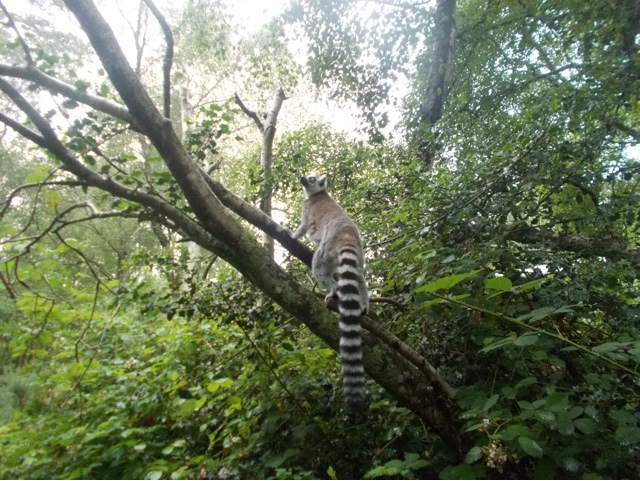 My mum took this lovely photo of a ring tailed lemur in the walk through lemur enclosure. As you probably gathered, we thoroughly enjoyed our visit. 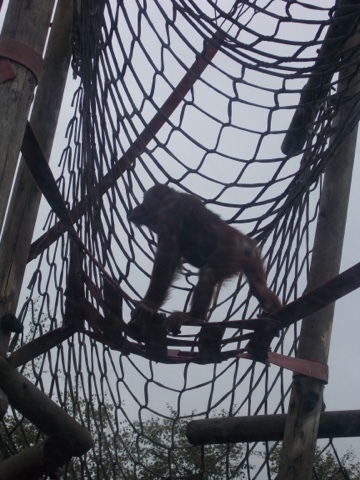 Monkey World is a magical place where the lives of mistreated animals have been turned around. The monkeys are fascinating to watch, some of their characteristics are so human like. 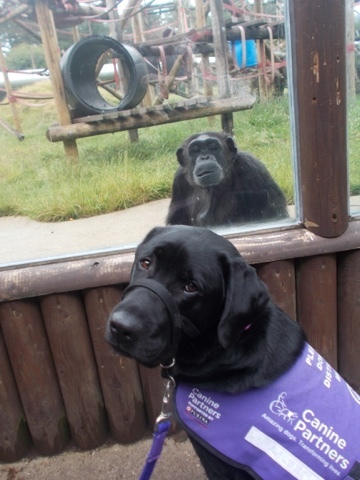 I fell in love with all the monkeys, but I especially enjoyed spending time with Sammy the chimp as he seemed fascinated by my assistance dog. Oshine the orangutan was one of my favourites too, while mum fell in love with the comical capuchin monkeys. We definitely plan on visiting again - probably several times! I am going to adopt Sammy the chimpanzee, and with the adoption you get an entry pass that's valid for a year. 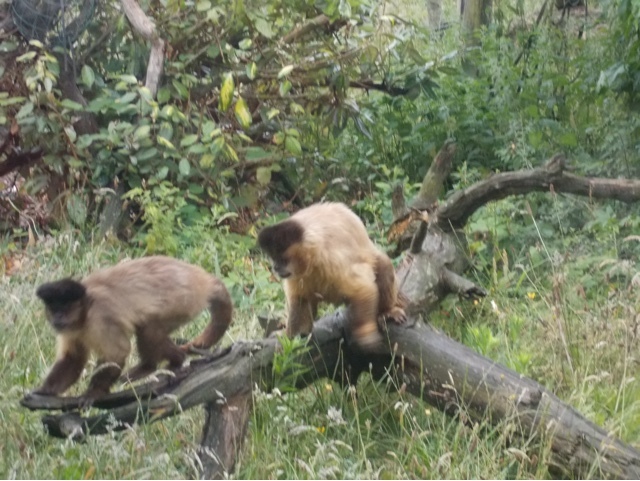 Mum is going to adopt the cheeky capuchin group. I thoroughly recommend a visit to Monkey World. It's suitable for people of all ages and abilities and you can easily spend all day there. 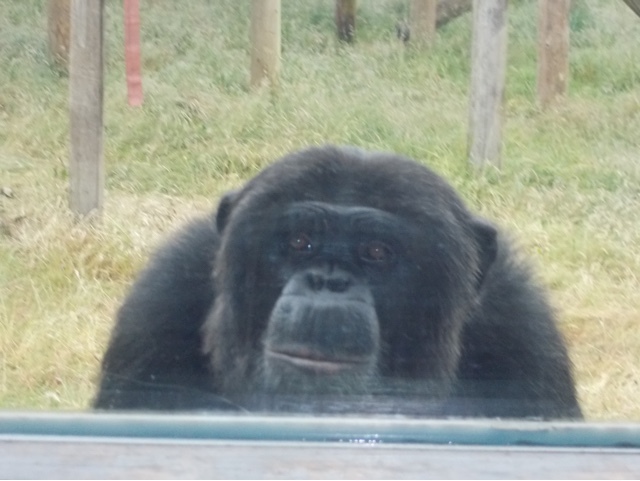 I will remember my day at Monkey World for a long time, it really was a special day.